You have no idea how hard it's been to convince Blogger to let me post this picture... I had to write the html code! Now this is probably no big deal for some one smart or who can be bothered... but me? I just wanna click 'insert picture' and then press enter... Flaws. 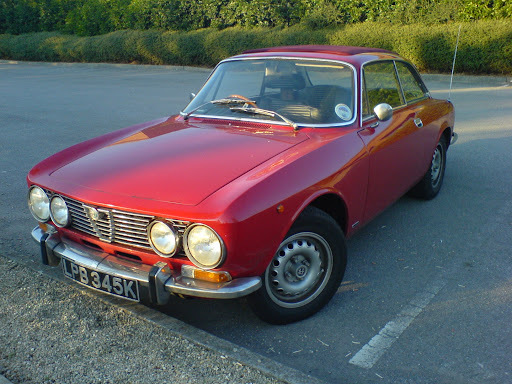 It's Richard's pride and joy Alfa Romeo, probably very interesting to people who like old cars. I liked it cus it had switches everywhere. Anyway, since I took this picture, I've finished my time in Bristol, and am now back in the Richmond office. Work was alot of fun but maybe a bit to anxious towards the end of the week. Anyway the project has only a few days left, and so I've got plenty more to get on with. Guess this brings this weeks travels to an end. Sorry it hasn't been as adventure packed as I had hoped, but "it's been emotional". I'll let you all know when I'm somewhere else!